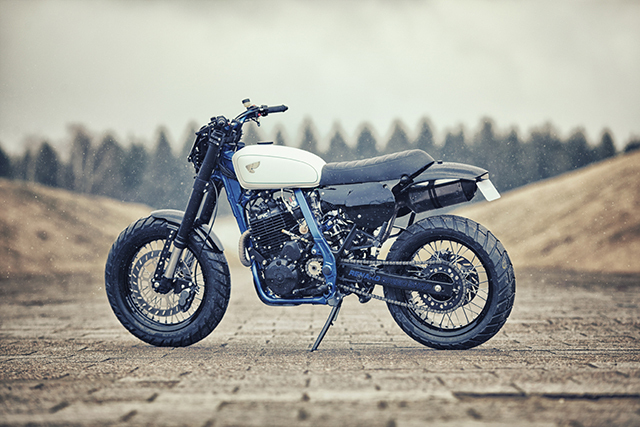 It was once a basic Honda 650 Dominator, now the bike before you is a certifiable scrambler beast, with the smile of a Dakar racer to prove it. If there is a legitimate gripe some motorcyclists have of the custom industry it is that while many of the bikes look great, they in fact ride worse than the standard item, sometimes they’re just downright dangerous. But the truth is, very few custom bikes are ever subjected to the sorts of tests a manufacturer puts their machines through. For a custom bike shop what better way to test your abilities than to build a bike for someone who can push it to its limits, a professional racer. 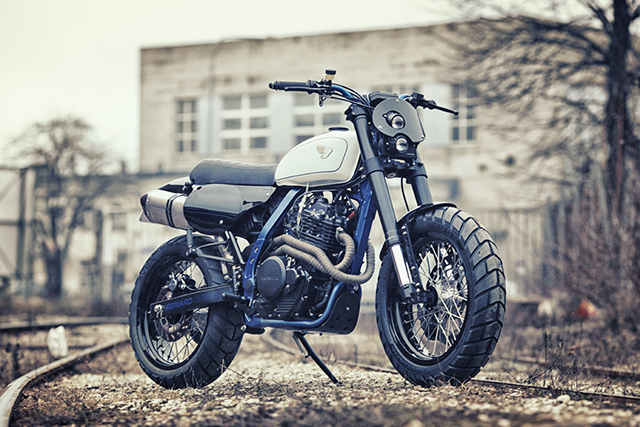 For Estonia’s Renard Speed Shop this was never going to be a problem, the 4th placed bike builders from our 2014 Bike of the Year Award, have a reputation for absolute quality and this scrambler for a professional Dakar racer only raises the bar. 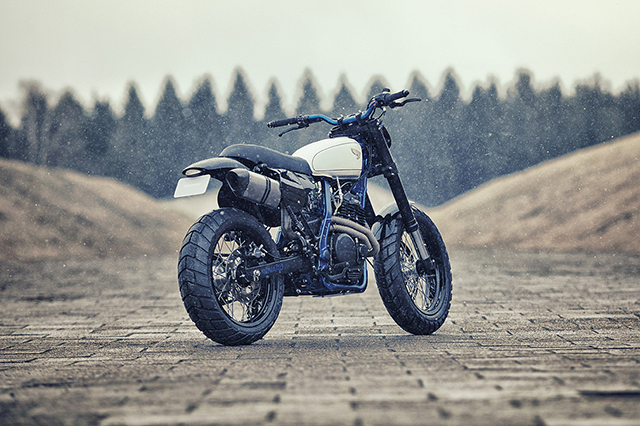 To start the scrambler build the boys at Renard wheeled over a big bin and began stripping off absolutely everything until only a bare Dominator carcass remained. The frame, rear swing arm, rear shock and the engine are all that didn’t end up at the garbage dump. This is the easy part of any build; it’s when the fabrication starts that we begin to find the limits between our creative and practical sides. 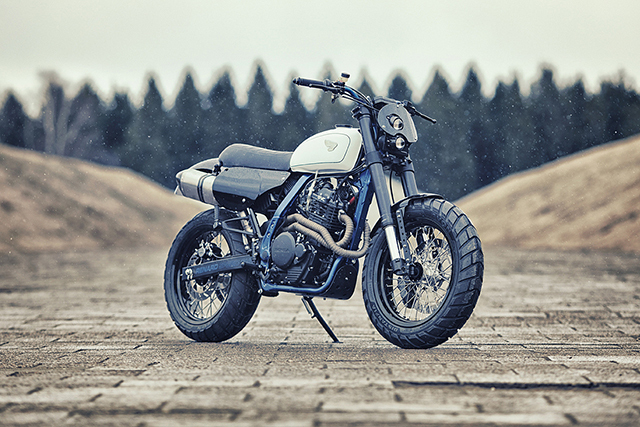 For Renard this is where they excel, evidenced immediately on this build with just how perfectly the modified Honda CB100 tank sits on the frame, the lines are simply perfect. The colossal rear subframe from the original Dominator could only peer over the bins edge as a new lighter and much shorter item was hand fabricated. Atop sits one of Renard’s own custom seats that not only gives the scrambler look but is designed to handle all sorts of weather and riding conditions. 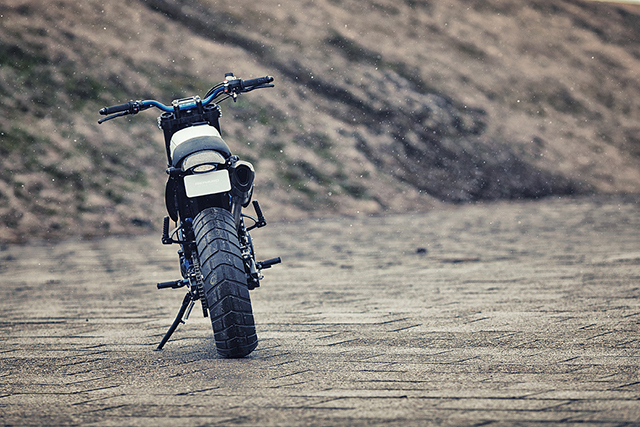 A scrambler with no fenders not only looks wrong but is a sure sign it’s never ridden to anywhere but an urban café. 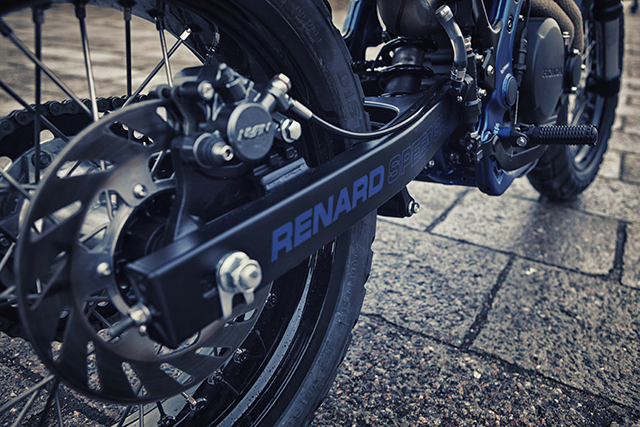 Renard are never prepared to accept second best, so hand fabricated the slimline front guard that is supported by drilled posts and the rear item that will handle all the dirt and gravel the big rear hoop can spit out. The side covers like the rest of the build are both purposeful and exceptionally finished with a nod to their racer rider. 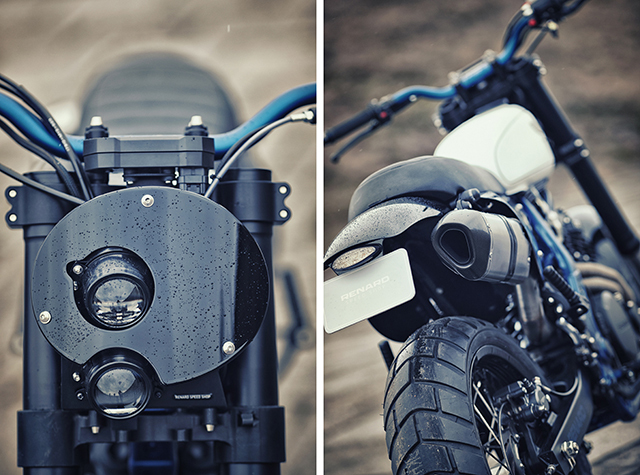 In truth a scrambler’s looks should really only identify the design through a form that is uniquely functional to the object of its purpose. Which is to destroy any road or barrier it comes across, from desert trails, to dirt tracks or jumping Nazi fences in The Great Escape if a scrambler can’t handle these challenges then is it really a scrambler? Well Renard answers that handling question with a set of Sölva’s competition SM front forks, industry leading hardware that come with a five figure price tag. Not totally satisfied even with these lofty standards the engineering talents of the team combined to shorten the forks 18cm, these are the limits you have to push to impress a professional racer. 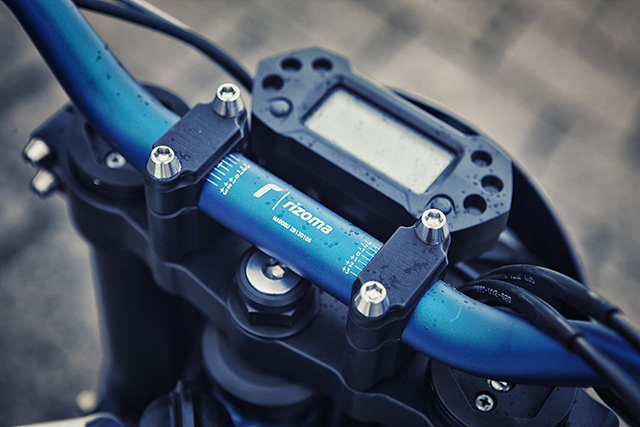 The brakes and hoses have been upgraded to match the handing prowess of the Sölva suspension, while unsprung weight is further reduced with competition spoked rims shod in chunky Avon rear tyres at both ends. The cheap price and plentiful parts of the Honda Dominator are not the only reason they make a good base for a build. 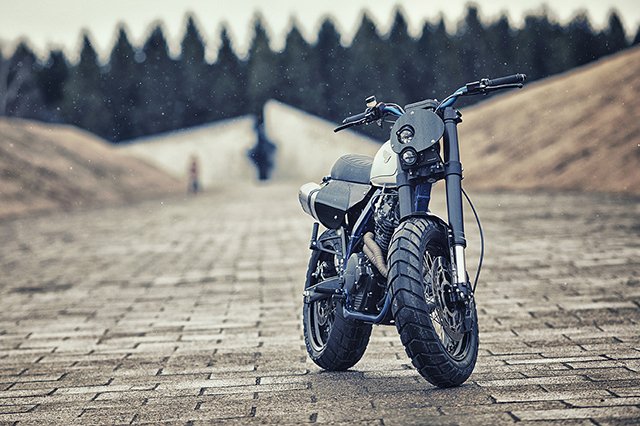 Its light weight and torquey big 650cc single perfectly match the needs of a scrambler. Performance is further enhanced with an exhaust that utilises an Akrapovic shorty MX rear can with original heat wrapped headers. While the big puddle problem of sucking in gallons of water is solved with a high performance water proof filter on the intake side. Grabbing gears as you throw the Renard scrambler at all conditions is a darn sight easier with a Magura hydraulic clutch conversion that ensures consistent feel with every pull of the lever. At this point I’m again reminded at just how performance focussed a machine this is, we’ve barely touched on its appearance despite the fact it is an incredible looking machine. The CB100 tank is coated in white with a subtle pinstripe and is topped off with a stunning engraved Renard gas cap. The blue frame matches the Renard Speed Shop graphics on the swingarm, with a set of Rizoma bars completing the theme. The under-over headlights peer through a race plate with a roadworthy low and high beam combination, while a set of Kellermanns BL2000’s, almost invisible to the eye, take care of the indicating. Keeping a track of vital signs is a Koso enduro speedo unit with all electrics running through a Motogadget power box. There is even a tail light and numberplate combo out the back and you start to realise that Renard Speed Shop simply leave no stone unturned. Here is a competition quality motorcycle that will take all a professional racer can throw at it while remaining road legal and it all started with a simple old Honda… incredible.